Internet data is still expensive in India regardless of the service provider you are using on mobile. Digital India initiative have started the service for Public Wifi services in places such as airport, bus station, railway station and government offices. However finding the public hotspots around is not an easy task. In this post, we review Wifire app that allows you to do just that. Wifire is a very handy app for frequent flyers, students and the people who can't afford expensive data plans. Wifire solves the problem of searching for public wifi hotspots. Here are some of the interesting features of Wifire app. App doesn't have any complicated option. You just login to the Wifire app using Google account and it shows you the map. It also has the option to list the nearby Wifi places. You can also set the home, public and work networks within the interface. App asks you to either manually set the public Wifi spots you find or use the Wifi spots added by the others. User interface is very simple and easy to use even for beginners. After the Digital India announcement government has started creating free WiFi spots. Now you can easily map such WiFi spots using this app. When you open the app, it can give you idea of how many WiFi spots exists around your location. You can find the WiFi nearby your place and it can also guide you closer to the hotspot around. You can also set the notification when you are closer to the Wifi spot nearby. Such notification can arrive both in-app and on the Android panel. Map is also handy to access the public hotspots that provide specific government related content. There are few more map specific features upcoming in the app such as geologging. You can also log the network manually and let others know if there is any free WiFi available. This feature shows you list of the network available to you for free nearby. You also get the distance value next to that network. The list can be bigger or small depending on the area where you are accessing the network. Most of the cafe, railway stations and airports have such free hotspots that you can access. 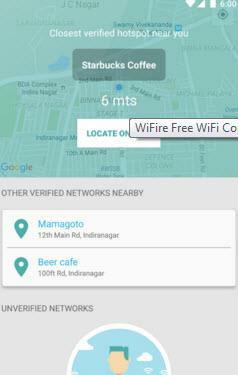 You may also find free WiFi spots nearby library and this app can find in-premise hotspots too. Most of the public WiFi places often have the username and password to avoid the abuse. In such case you have to remember the new username and password when the spot changes the details. This app keeps log of such password changes. And it let's you auto-fill the fields whenever you have to login to such spot using the credentials. All you have to do is tap into the app and select the spot which you wish to login. There is one bug within the app that crashes the app. This bug increases the time for the data to validate before auto-fill, this gets app to crash. This bug has yet to be fixed so some WiFi spots can't be logged in due to this feature bug. It can fill out the form and OTP numbers on your behalf. This makes Wifire very handy app for those who struggle filling up form. Most of the public WiFi have issues with breaking connections. Some are often throttled with too many requests and the server goes down. In such cases you may have regular connection issues. Wifire makes sure that you get to auto-connect if the connection breaks. You don't have to remember the login details every time the connection breaks. This is very handy feature especially when you are travelling within bus or metros. In such places you can't use both hands to type the username and password. For such places this feature can be really handy and effective most of the time. Wifire app is constantly changing itself to keep up with the public WiFi changes. So you may need to update this app whenever there is an update arrives. You can also use the public WiFi to update some of the apps on your Android. There are some negative reviews for the app due to it's disconnection issues. There are also multiple apps with this name so check the description for the app that has name : getwifireapp. Wifire is definitely one of the most useful app for those who wish to use public Wifi while travelling. 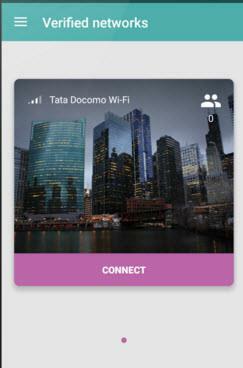 Though the app has some bugs and connectivity issues, it still can be handy if worked on some Wifi places. There are very few Wifi locator apps out there that works effectively for the public WiFi monitoring. Wifire fills this gap very effectively and that too with the free of cost.